Ichiro fields with a custom Mizuno GMP70BK. Just as we showed in our last post about his hitting, Ichiro’s transcontinental body of work as a fielder is just as impressive. Ichiro won 10 consecutive Gold Glove Awards in the Majors (2001-2010) and before that won the Japanese equivalent, the Golden Glove, 7 times, for 17 total awards, all consecutively. Had he played in the Majors all along, 17 Gold Gloves would have put him second all-time behind Greg Maddux (18), and five ahead of the next closest outfielders—-Willie Mays and Roberto Clemente tied at 12. Still, even if we only count his Major League Gold Gloves, he is one of only six outfielders to win 10 times since the award was created by Rawlings in 1957. Ichiro’s glove is and has always been (since 6th grade!) a Mizuno with that sprawling, fishing-net-like “Ichiro” web. There is a great article here on Ichiro’s relationship with the craftsman who handmade the Gold Glove-winning leather since his first pro season. Just as with his bats (which he stores in a humidor in the clubhouse), Ichiro treats his glove like a master craftsman would treat his tools. He says there is a “human spirit” in his equipment, and that his glove is an “extension of (his) body.” The GMP70BK is modeled after Ichiro’s glove, and is available online. 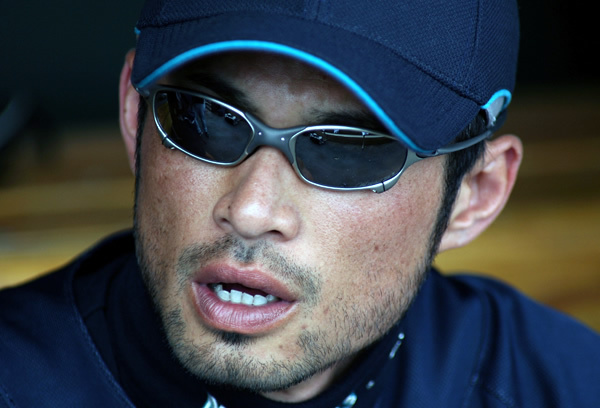 Ichiro has also been known to wear some provocative eyewear over the years. Most recently, he has been wearing his signature series Oakley Radar Path that you see in the feature photo above. Although we have seen him wearing a white/light blue version as well as a red version in Spring Training this year (left), and many different versions over the years. One of those versions is the “Juliet” Signature Series (below) that he wore a few years back. They are actually available through Oakley’s website, while the Radar Path sunglasses seem very hard to find. Ichiro wearing the Oakley Juliet series. 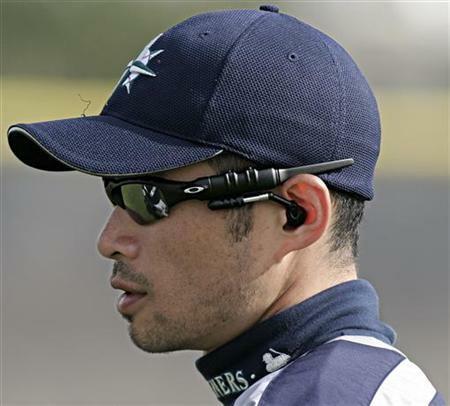 Here is another picture of Ichiro in the Oakley Thump MP3 player sunglasses which can also be found on Oakley’s site. Obviously this was not in-game, but still pretty cool to see Ichiro jammin’. I’d love to know what he’s listening to. Ichiro bumping beats in his Oakley Thump sunglasses. Follow us @whatproswear to see player posts instantly. Get WPW updates on your Facebook feed.